SoftPlanet makes it possible for everyone to get free MKV Player download directly from our servers. There is no registration needed for downloading. 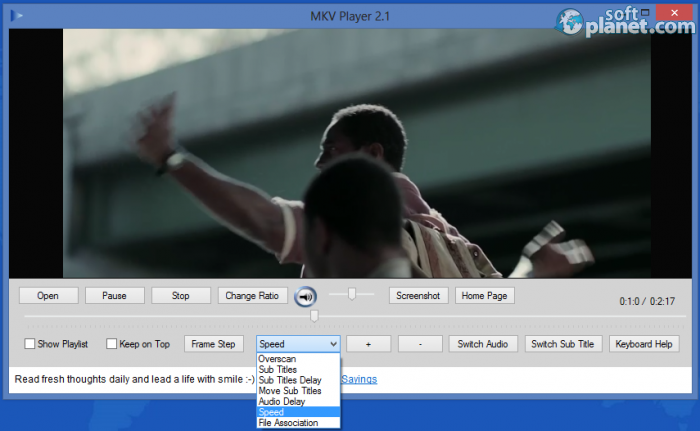 MKV Player 2.1.17 is a very easy-to-use simple video player. It is a unit of the Vsevensoft series of video and audio utilities. It is completely free for download and can serve you well if it plays various media file formats. MKV Player is a tiny light-weight video player, which provides you with only basic functionality. Regardless of its name, MKV Player can be used for most video file types, not only MKV. Most of the features provided can be found in a single drop-down menu. Some of them are Speed Control, Audio Delay, Subtitles Delay, Move Subtitles etc. In my opinion the interface of MKV Player is its weakest point. It looks like it is from the era of Windows 95. The producers could play a bit more with the design. Another thing about the interface is the Playlist position. Once it is activated, it is pinned and you are not able to move it. This won't be an issue if it wasn't placed on top of the movie. My recommendation to MKV Player makers is to configure the Playlist just like all other players and make it free flowing. The notification bar is another thing that can be changed in the design. It appears on the screen every time when you change the volume or use the movie slider button to scroll over the movie's timeline. It's great to know what the volume level is. However nobody wants to see some notification centered exactly above the movie. It would be better to move it in one of the corners. MKV Player 2.1.17 is very easy to operate due to its clean design. You have quick access to each one of its features without searching for them within endless sub-menus. MKV Player is a very useful lightweight video player. If you need something simple and well-functioning, MKV Player is your solution. However I recommend that its producers take some time to develop a more appealing interface. Our security scan shows that MKV Player is clean from viruses. The current version of MKV Player has been scanned by our system, which contains 46 different anti-virus algorithms. That ensures that MKV Player 2.1.17 is 100% safe for your computer.